You may remember hearing that the Seine River flooded a few months ago. Because of this, the Musée de Louvre was closed during our first few days in Paris, which meant we couldn’t visit it until our last full day in the city. Before hitting the museum, Marie and Taylor and I started the day with pastries again because Paris. (White bread is basically protein there.) We took the metro to the Louvre and met up with our friend James at an adjacent Starbucks. (This would be our real fuel for the day.) James was one of our good friends from Asbury and just happened to be in Paris briefly after touring Turkey and Iraq and Italy and I can’t even remember where else. (Let’s just say he got questioned at U.S. Customs when he returned.) It was perfect timing to meet up with him. Finish your Starbucks before you attempt to enter. For some reason, the curators don’t want any coffee stains on their ancient, priceless art. When my Starbucks was spotted, I had to get out of line and chug it. Use the downstairs entrance (the one from the metro). It’s approximately a thousand times faster than the main entrance through the famous glass pyramid. Thanks, Marie, for the insider knowledge yet again. Though the Louvre has been a museum for more than 200 years, it had previous lives as a fortress, a castle, and a palace. Its initial construction began in the 12th century, and it played home to the kings of France on and off until they moved to the Palace of Versailles. 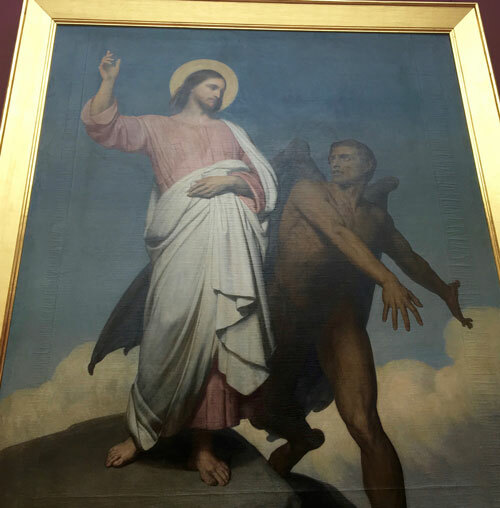 "Jesus telling the Pharisees what's up"
"Jesus telling Satan what's up"
These days it plays home to artwork. We saw pieces by Michelangelo and Da Vinci and Delacroix. We saw colossal ones like the Wedding at Cana and diminutive ones like the Mona Lisa. And we saw lots and lots of sculptures (and paintings) of naked people. Fun fact: When this sculpture was carved 2,000+ years ago, humans still had wings. I'M JUST KIDDING, YOU GUYS. SHEESH. To see a human body carved out of marble is amazing. The detail is unreal, by which I mean it is very real indeed. The skin, the toes, the leg muscles and back muscles, the belly buttons — everything is accurate. It looks as though someone poured liquid marble onto an actual human — that seems more believable than that each groove and ripple was carved out of stone. And I know this probably isn’t the takeaway you’re supposed to have when you go to the Louvre, but what struck me most about all the artwork we saw there was not just the lifelikeness of the sculptures, but the shapes of their bodies, the females in particular. I hate them, and yet, oh, I want to look like them. I have found the best thing to do when I see images like that is look away. Let your eyes linger on the perfect stomach in the Victoria’s Secret window, and you’ll inevitably start regretting the soft pretzel you ate in the food court 15 minutes ago. It’s better just to grant yourself (and her, perhaps) the dignity of looking away. But if you go to the Louvre, you should look at the bodies — because these bodies don’t look like those ubiquitous ones, though they are familiar in their own way. If these bodies had brains in their marble heads, brains accustomed to 21st-century standards, they’d likely feel they needed to lose 20 pounds. And it isn’t just their thickness that defies modern expectations — it is their proportions themselves. These sculptures wouldn’t just need to lose weight in 2016; they’d need to remedy their very ratios somehow — they’d need narrower hips, flatter stomachs, bigger this, and smaller that. Not because the artist made a mistake, of course, but because the artist depicted bodies as they actually are, sans Photoshop. I wish every girl who’s ever thought her ratios were wrong could stand in the Louvre, in one of the many sculpture rooms, and realize that all of the bodies up on the pedestals looked like hers. And I wish she could feel, like I did that day, that perhaps her proportions weren’t wrong at all. Perhaps they were carefully carved, formed by skillful hands, worthy of display in the world’s most famous museum, lauded for ages. That afternoon at the canal was one of my favorite memories from our time in France. We’d been going-going-going all week (which is the way to do Paris for sure — there’s so much to see — but still tiring), so it was nice to slow our pace for a few hours. I felt like an actual Parisian that afternoon — eating more white bread, dangling my feet over the canal, taking my time at life. We browsed shops near the canal as well, popping into Le Comptoir General, which is like an Africa-themed coffee shop (it’s a little Inception-y because it feels like you’re in Africa … in France) and then making our way over to Marai, the Jewish Quarter. There we witnessed an incredibly bizarre animal rights demonstration complete with a girl in skin-colored underwear being covered in fake blood and packaged like a chicken breast in a life-size Saran-wrapped package. James made a speech about Harambe (because how could you not in that situation?). After a bit more shopping and another stop at a patisserie (sue us), we took the metro home for our third and final (sigh) dinner of bread and cheese and pastries! Let it be know that whenever I’m in Kroger these days, the French baguettes and goat cheese call out to me. In France they seemed honorable for their frugality. In the U.S., they seem extravagant for their carb content. While nomming on this frugal French fare, we learned, that due to ongoing Air France strikes, our return flight Saturday was up in the air. By which I mean, it might not be up in the air — it might be thoroughly grounded. It was figuratively up in the air whether our flight would ever be literally up in the air. I crack myself up. Unsure whether we’d be flying out Saturday (as scheduled) or catching a Friday flight so as not to get stranded in Europe, we decided to live it up on our potential last night and headed to the Eiffel Tower to make a video that James really wanted to make. He had a vision, really: He wanted to lip sync “Guns and Ships” from Hamilton (the song about LaFayette, America’s favorite fighting Frenchman) with Marie-Claire (our friend group’s favorite writing Frenchw’man) in front of the Eiffel Tower. The goal was to time it so that the tower was sparkling in the background, which was problematic because the tower’s lights show only lasts for five minutes every hour or so, and the sparkly lights in particular only last for about 15 seconds of that five minutes, which meant we had a very limited number of times to do takes and still make it back to the metro to get home. But in the end, we made it work. Taylor did lighting, and I did video, and James and Marie were the stars. James actually edited the video, overlaid the sound, and uploaded the final product to the internet while we were still sitting at the Eiffel Tower because technology is amazing. Because the EuroCup was starting the next day, tourists from all over had flooded into town, and the area around Eiffel Tower was buzzing. We sat at the Trocadéro and soaked in the lights and the fountains and the people. That night I felt newly indebted to France — for sharing their cheese and pastries with us all week and for sharing their guns and ships with us 200 years ago. We took the metro back, not knowing what the next day held. Our new decision to take a Friday flight led to very frantic Uber and metro rides to the airport. (At least I was frantic. Marie and Taylor seemed like cool French cucumbers.) In the end, we made it on time and entered the weird space-time continuum that is an international flight going east to west, having left Paris in the late afternoon and landing in Atlanta in the evening. Because we came back early, I had a Saturday to kill in Atlanta before my flight back to Louisville, which meant I got to spend some time reacclimating to the U.S. with Taylor. We brunched at a little breakfast diner near her house. I had a warm and crumbly egg biscuit that felt exceedingly American. Oh, and we went to Target twice that day, which also felt exceedingly American. I felt as though Target was personally welcoming me back to the states. Here’s my summed-up take now that the trip is all said and done: If your friends say, “Hey, do you want to plan a trip to Europe in two months?” and you can make it work, do it. And if you don’t have a friend suggesting it, maybe be the one who does.